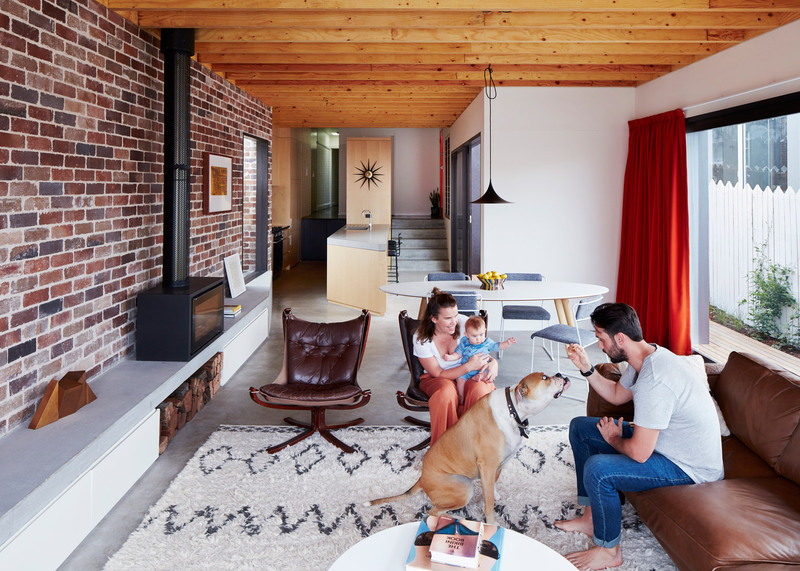 Australian studio Those Architects has overhauled a house in a beachside Sydney suburb, creating a spacious new living room featuring secret storage, concrete surfaces and a pivoting garden window (+ slideshow). 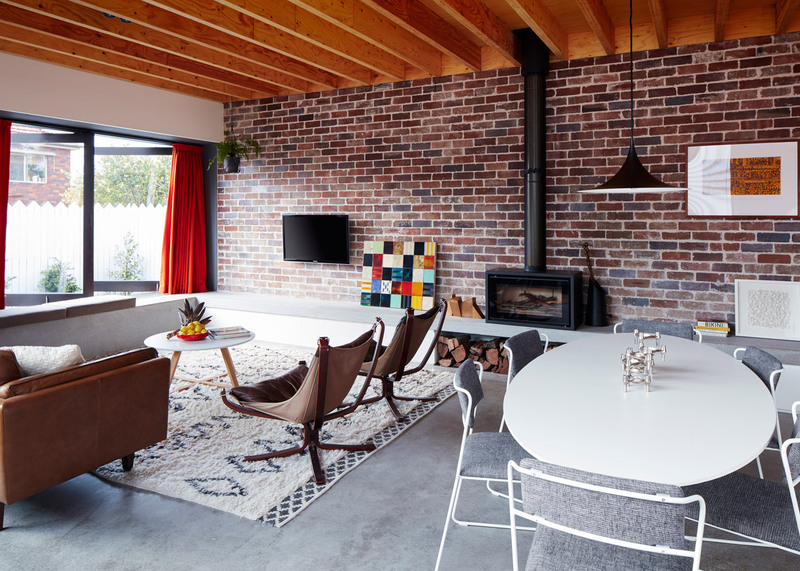 Maroubra House is a 70-year-old bungalow that had originally belonged to one of the clients' grandparents. 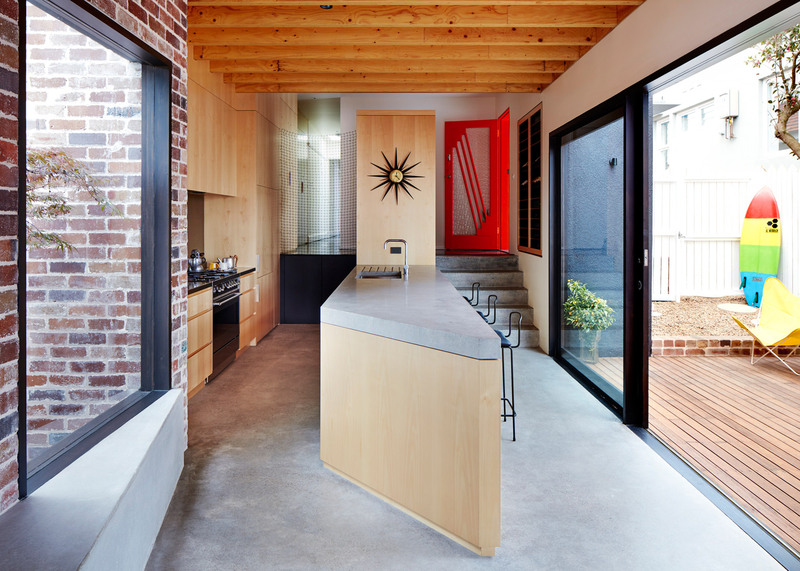 Those Architects founders Ben Mitchell and Simon Addinall were tasked with making it more suitable for a young family. 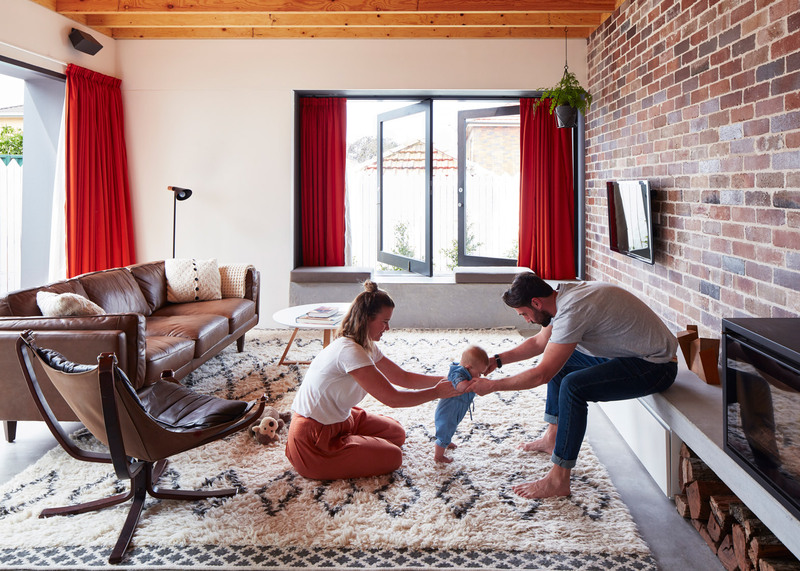 "Typical of the post-war, mass-built, semi-detached houses in the area, it sat on a small block, had tiny rooms, a single bathroom, separate living, cooking and dining areas, and was on a sloping block with no connection to the outside," they said. 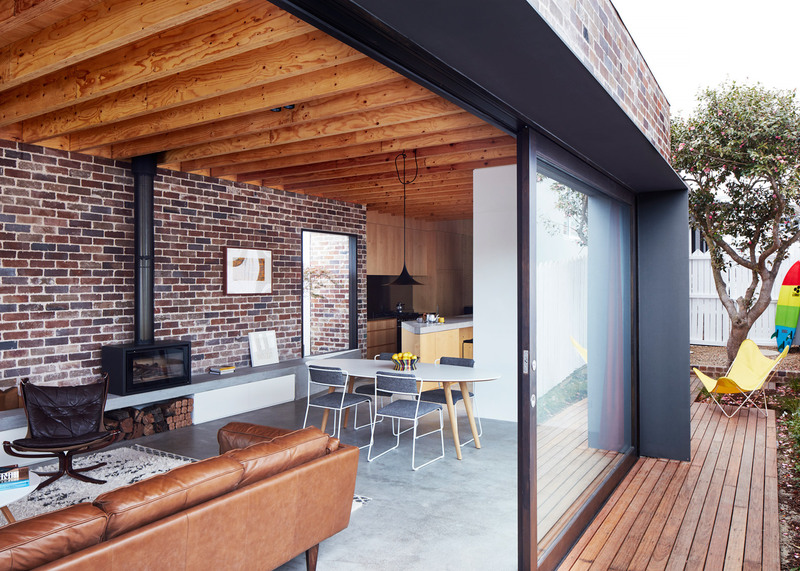 Their solution was to relocate living and dining areas into the garden at the rear, making more room in the existing single-storey building for bedrooms. This meant losing a lot of the property's existing outdoor space, so the architects created a new north-facing courtyard. The courtyard forms an extension of the new living area, so the clients can easily dine outdoors. It also helps to bring more daylight into the building – something it was lacking before. 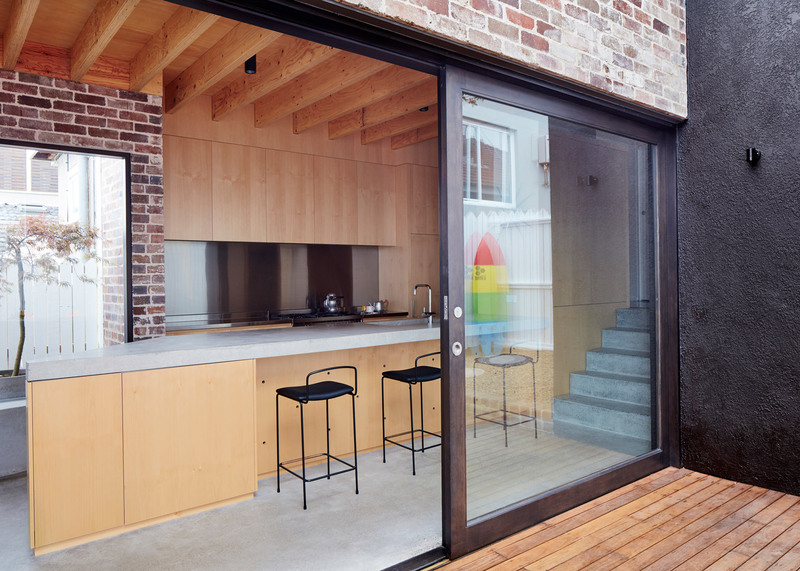 "The typical design solution in the area is to build off the back of the existing dwelling, two-storeys high, running boundary to boundary," said Mitchell and Addinall. "The problem with this is it creates a major disconnect between the house and backyard." "We [instead] sacrificed some open space at the rear of the property, which the clients were happy to do as they are minutes from the beach and large community parklands," they added. "The result is a courtyard that is still in sun well past three o'clock in the afternoon, even in mid winter." The new living space is set at a lower level than the rest of the house, bringing it in line with the garden. The room has an L-shaped plan with a gallery-kitchen at one end, and a combined lounge and dining area at the other. A concrete bench is built into one wall and spans the entire length of a wall. This creates extra seating, but also doubles as a concealed storage area for books, toys and audio-visual equipment. 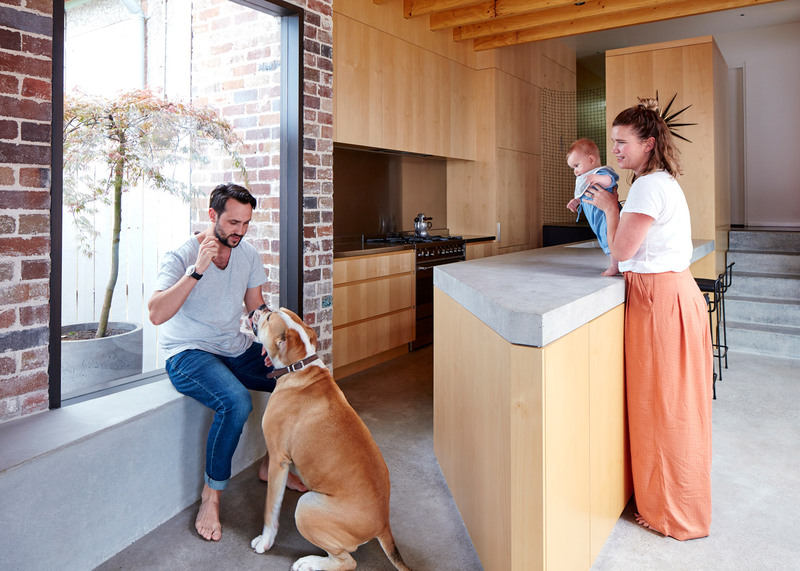 "It connects the outdoors and indoors, connecting the rear yard to the inside through the large, pivoting eastern windows – which the dog loves to use as a short-cut to the garden outside!" said the architects. Giant pivoting windows also feature in a few other recently completed houses, including a holiday home in Mexico and a renovated Antwerp townhouse, where the glazing feature is claimed to be the world's largest of its kind. 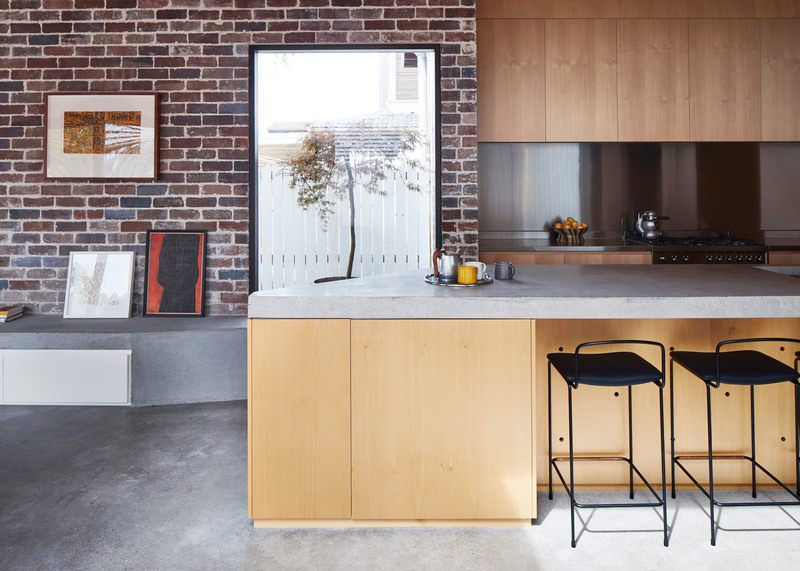 The aim was to use "honest, cost-effective and low-maintenance materials" wherever possible – similar to another recently completed renovation in Sydney's Bondi Junction. 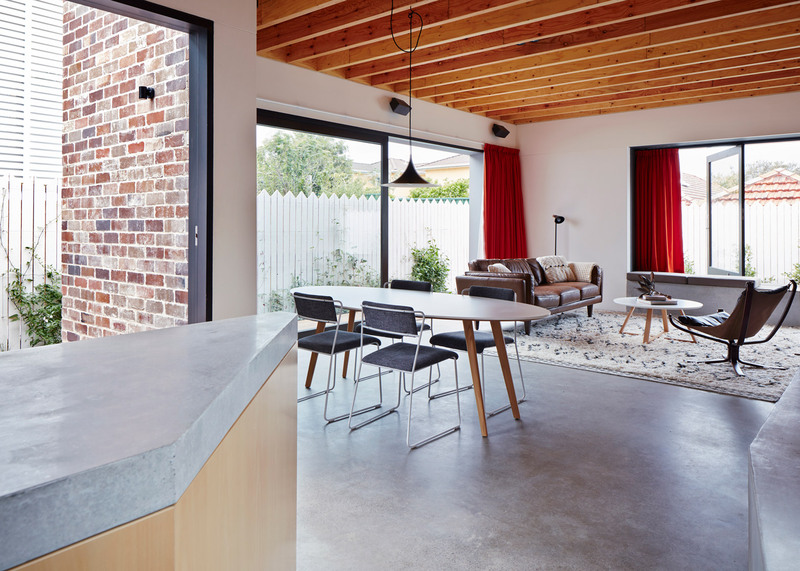 The bricks used to build the Sydney extension were recycled from other parts of the house. 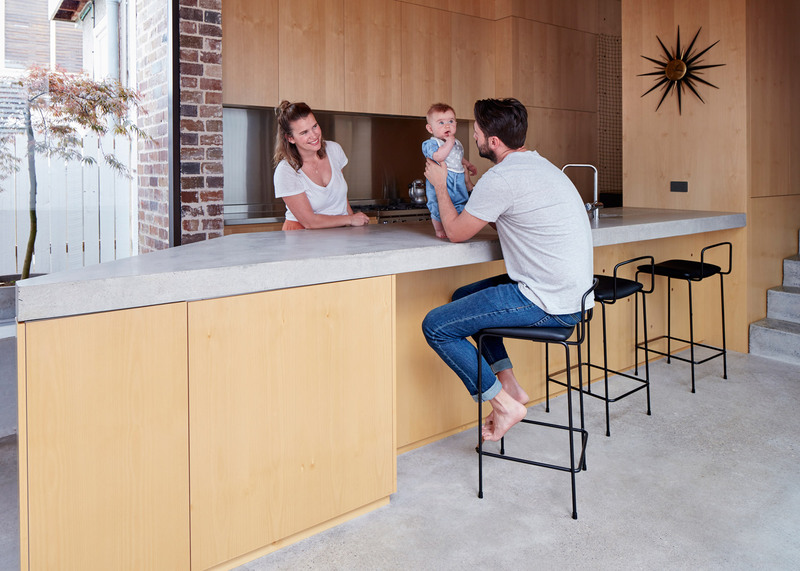 The floor is polished concrete – helping to provide passive heating and cooling – while plywood was used for the ceilings and for joinery. 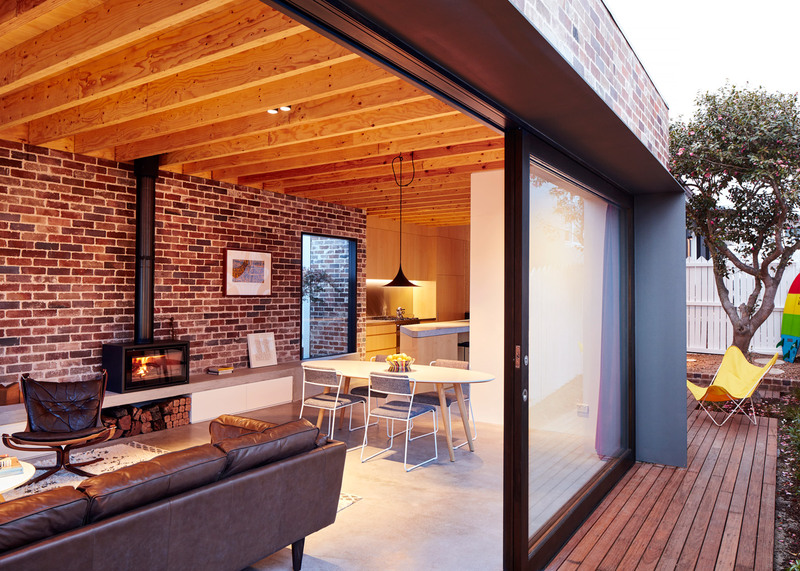 Other additions include a wood-burning stove built into the bench and a net that functions as a see-through partition. Aside from removing some of the old walls, the existing house was left much as it was to retain its historic character. But existing cypress pine floors were stained black and a new bathroom was installed. 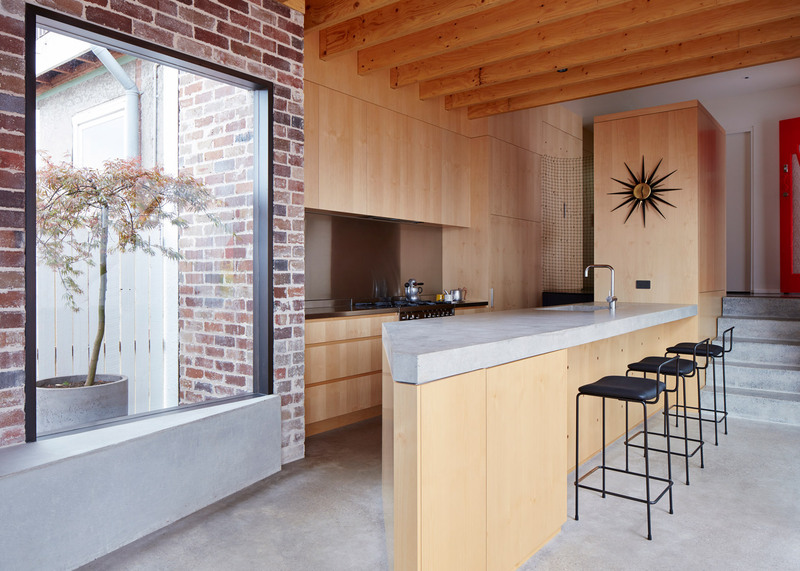 "We kept the character of the existing house intact, with all skirtings, cornices and ceiling mouldings retained in their original form," said the architects. A new side entrance is located between the old and new sections of the residence. On one side, a space is left empty to accommodate a future first-floor extension. "The design also includes a second storey, which is yet to be built," added the architects. "We obtained planning approval for it at the same time as the rest of the development and all the required structure has already been placed in walls and ground to accept the upper floor once the clients are ready." Photography is by Luc Remond.